Kiwano (Cucumis metuliferus): growing, planting, caring. An odd-looking, yet delicious fruit ! A native to the hot, dry climates of central and southern Africa, Kiwano is a member of the Cucurbitaceae family and a cousin of melons and cucumber : leaves the shape of those, and yellow flowers just like its cousins. 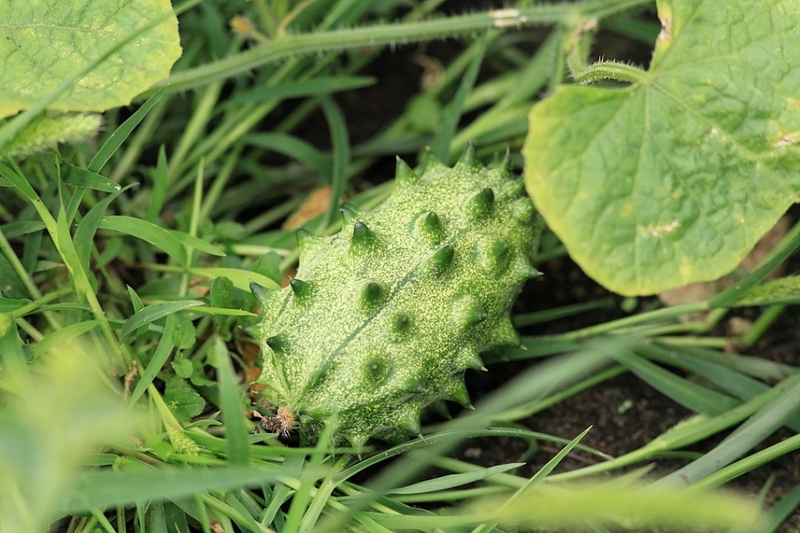 Kiwano horned fruit performs best in full sunlight and well-drained, slightly acidic soil. It can be sometimes difficult to recognize a member of the Cucurbitaceae familyjust looking at the leaves - but if your plant bears odd-looking, spiky, yellow-orange fruits, chances are it's a kiwano ! Plant your kiwanos bought from the merchant in a rich, well-drained soil, in full sun, after the last frosts. Space the feet from 0.8m to 1m. Water after planting. Inside: Sow under cover between March and April under filtered light, above 15 ° C - at best between 24 and 32 ° C. Sow three seeds per cup, burying them lightly in a special compost for potting. Water once a day the first week. Outside: Sowing in open ground is only done in very hot and sunny regions. Sow three seeds per hole, in the garden, in full sun. Allow at least one meter between plants. Water generously. When the plant has between 3 and 5 leaves, "pinch" — or rather, cut! — the tip of the stem so they can divide. Once the new branchings each have 3 to 5 leaves themselves, repeat the process. Once the fruits appear, pinch off the stems below the first first, one or two leaves further down. Transplant in rich, well-drained soil in full sun after the last freezes. Space the plants 0.8 to 1 m apart. Water after planting. Harvest once your fruits are well-developed, around 60 days after planting. Pull up the kiwano plants after harvesting, and use the remains as compost. There are three times to water — water the seedings, water after transplanting, and water in case of drought. After sowing, water at least once a week, without flooding the pot. Continue to water twice a week after transplanting if there is no rain. Finally, keep an eye out for dryness while the fruits are forming, in summer. In any case, don't get the leaves wet. Mulch the base of your kiwanos after transplanting, which will limit the need for watering and save the fruits from rot.